DE Engineers Aerated silos keep grain in top condition. GRDC studies have shown that the two most common, serious threats to grain quality in Australia’s storage are insect pest infestations and grain moisture problems causing mould / fungal growth. Key initial strategies include thorough hygiene for storage and equipment, plus aiming for “cool, dry grain” in storage. Using aeration reduces grain temperatures and creates uniform, cool conditions in the grain bulk. This maintains grain quality and if cool enough, slows grain pests breeding and if temperatures below 15C can be achieved, breeding will stop. Some of our customers have used aeration on silos for up to 10 years and have not had to use any fumigation whatsoever as weevils have completely disappeared from their silos. It also assists in maintaining germination rates and is considered essential in canola storage. It is important to note that aeration may not eliminate the need to fumigate insects. If there are live insects present, the grain will need to be fumigated prior to delivery gate. 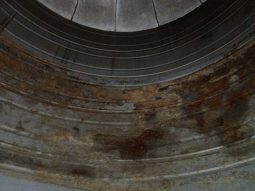 All silo manufacturers in WA make fully sealed silos to increase the effectiveness of fumigation but this had led to silos which do not vent to allow moist air to escape resulting in many calls regarding moisture in silos with the culprit usually being moist grain and it is Important to note that even though silos seal, they are only designed to seal for the 7-10 day fumigation period. At other times they should be ‘cracked-open’ or ideally aerated with a controller to allow headspace heat to escape and maintain uniform grain moisture and temperature. Not many people realise that a 76t silo filled with grain that has too much moisture (above 12%) can condense 760 litres of water for every 1% released from the stored grain inside the silo which then runs down the silo walls ruining grain and corroding silo walls. Green radish in a silo will also increase moisture as could the application of water based pickle so be sure to store only clean, dry grain with a moisture content of 12 percent or less to keep grain in top condition and reduce weevil problems depending on the tolerance of the receival point but in most cases the use of aeration has eliminated the need to fumigate. 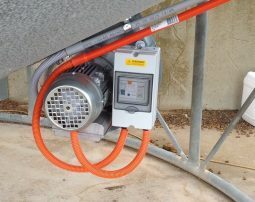 DE Engineers have developed a very sophisticated but low cost aeration controller (the ‘Safegrain 8”) here in WA for Australian farmers, produce our own fans and have also designed a unique ducting system “Aeroduct” which pushes air down to the bottom of the cone and up the other side for increased benefit. 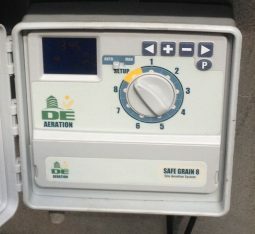 There are benefits and disadvantages to all grain storage systems – aeration is recommended by grain storage experts as an aerated silo which under optimal ambient temperature and humidity conditions will knock down grain temperature from around 35 degrees at harvest, then maintain the grain by forcing in only cool, dry air (below 80% humidity). DE Engineers unique aeration ducting is specially designed to push air to the bottom of the silo to ensure all of the stored grain is kept in optimum condition. 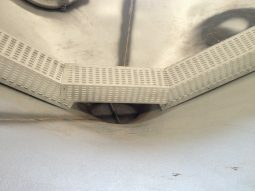 Each 100 series fan can aerate up to 100t of grain storage and are made by DE Engineers specifically for silo aeration. Start-boxes have 12 volt relays to start the fans from the controller output, Earth leakage and lightning-proof breakers for maximum safety. 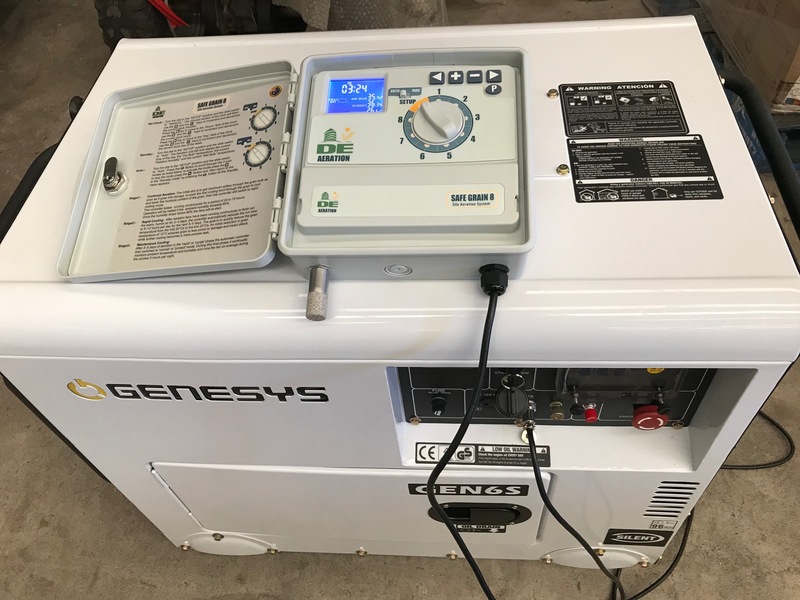 The Safe Grain 8 controller is also available in 12 volt with remote start to operate a 240v generator when required so you can maintain grain quality where there is no mains power available. Don’t let damp air ruin your silos. 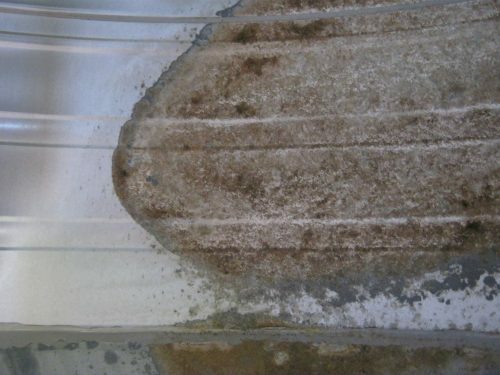 Every night when your silo cools, it draws in air from outside and if this is damp it will condense inside your silo ruining grain and corroding silo walls. Note the corrosion to the walls caused by the damp grain and the top ring where there was no grain is still OK. This was a near new 109t silo that was filled with grain at harvest that possibly had a little too much moisture that condensed to the silo roof then ran down the silo walls.